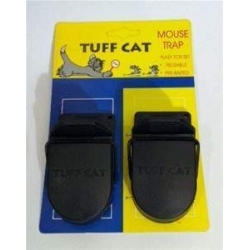 A Twin Pack of the famous Tuff Cat Mouse Traps. Easy to set & Pre baited Mouse Traps. Get rid of Mice in the attic or house with our range of traps. Live Catch Cat Cage Trap. Block Bait Mouse Killer Station.Twin Pack. Mouse & Rat Trap Bait Attractant.